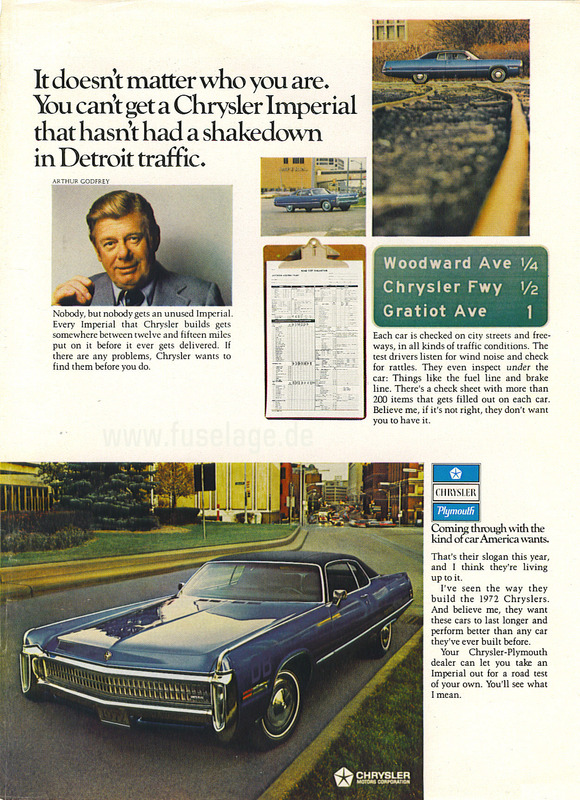 Actually the picture above is inside the 1972 Chrysler catalog. As was the case in 1971, there was no separate Imperial catalog in 1972. 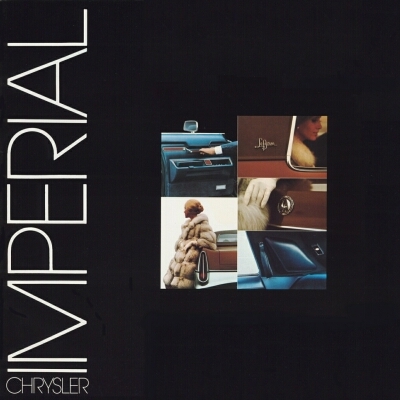 Imperial models were considered merely top-of-the-line Chryslers. For additional information about these cars not found here, please check the 1972 Chrysler catalog. 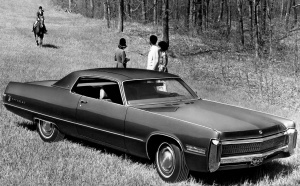 Like all Chrysler Corp. full size cars, the Imperials received restyled sheetmetal for 1972. 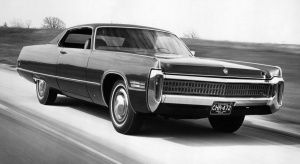 The entire front and rear were most visibly redesigned to set Imperials more apart from regular Chrysler models. Highly characteristic were the vertical tail and front parking lights. The eagle emblem was back on the hood. 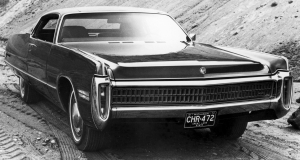 The body sides were now more rounded and came without the crease below the side glass and up the C-pillar found on previous years' Imperials and Chryslers. On two-door hardtops, the forward edge of the C-pillar was almost vertical. 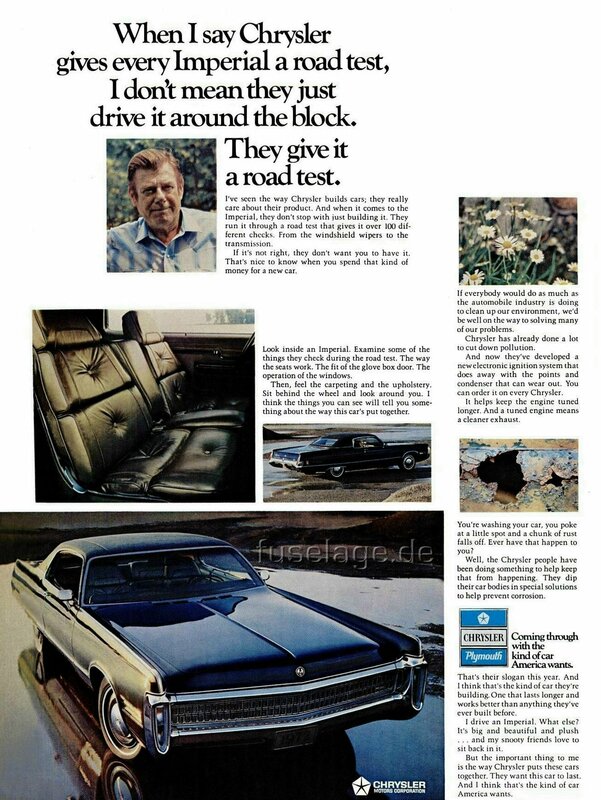 Interiors didn't change much: There was a new "wood" pattern on the dashboard and optional leather seats on 4-door models now featured a "floating cushion" styling. As usual on Imperial LeBarons, the vinyl roof came standard. The four-wheel "Sure Brake" anti-skid braking system introduced a year before was again available as an option. The new styling was well received by luxury car buyers. 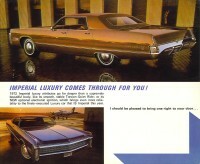 1972 Imperial sales increased to 13,472 four-doors and 2,322 two-doors. 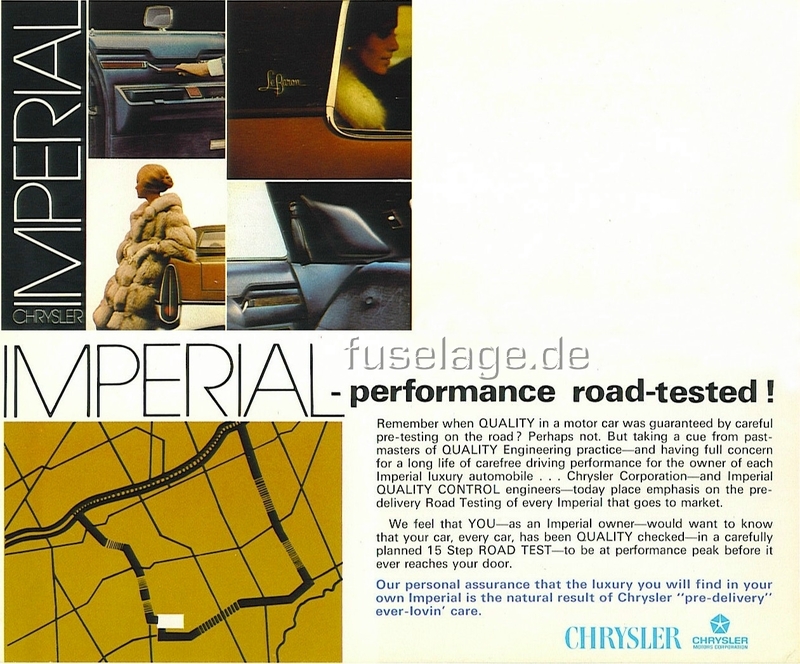 This 1972 Imperial ad was part of the Corporation's quality initiative, touting that eacht Imperial is carefully inspected and test-driven before even leaving the factory. I'm not sure if that's also Arthur Godfey in that inserted picture. Thanks to Rob for this contribution! Here's another ad being even more specific about the test drive each Imperial received. 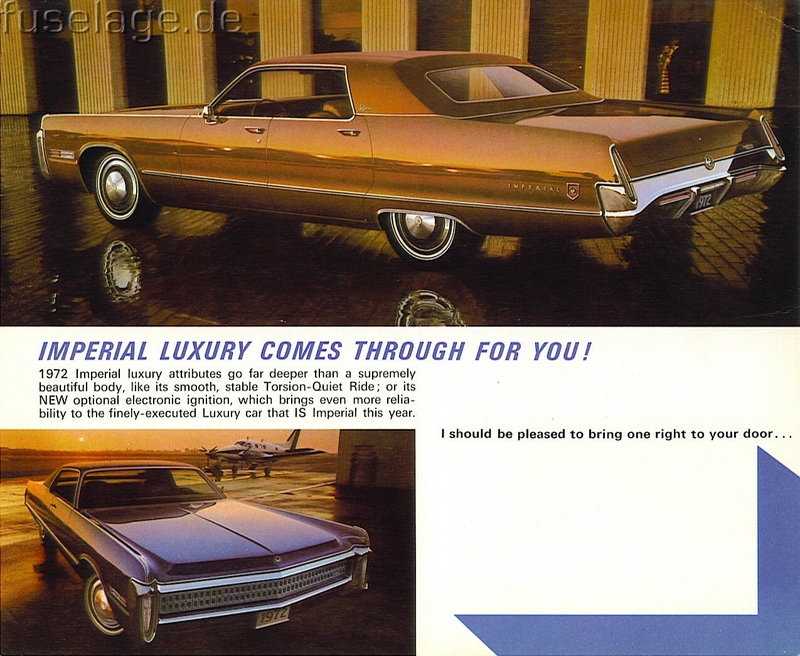 The Imperial in the lower photo insert looks somewhat pasted-in. 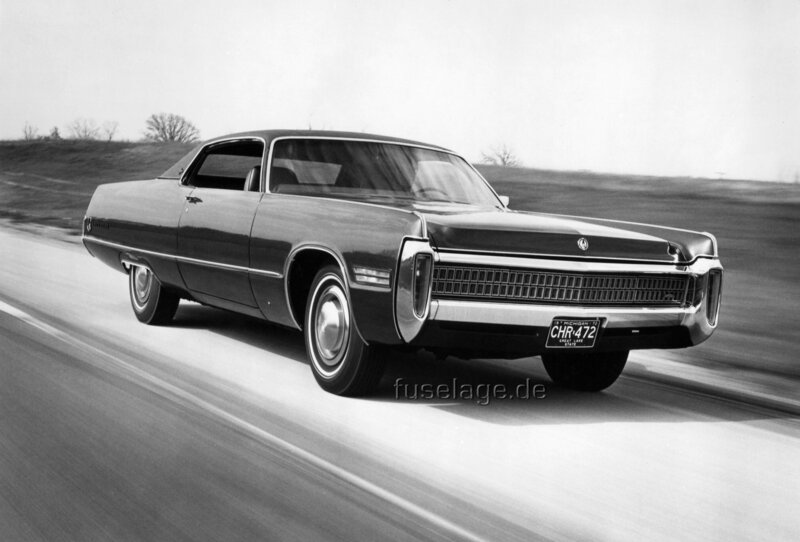 This is a press photo of a 1972 Chrysler Imperial LeBaron two-door hardtop. 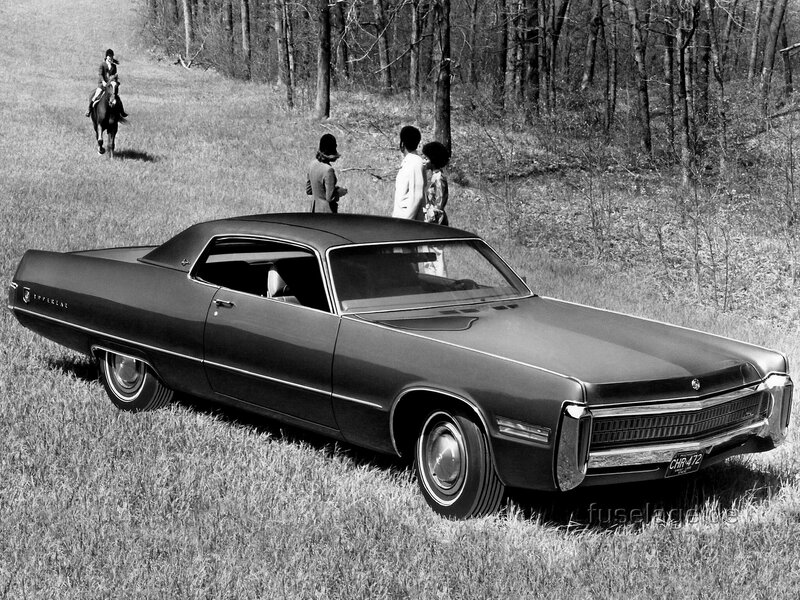 Another press photo of a 1972 Chrysler Imperial LeBaron two-door hardtop going straight ahead on a scenic highway. 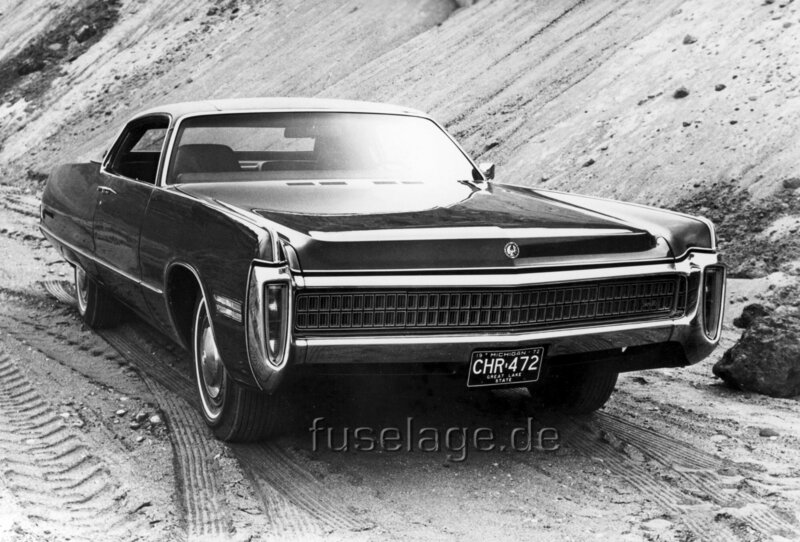 Press photo of probably the same 1972 Chrysler Imperial LeBaron two-door hardtop. 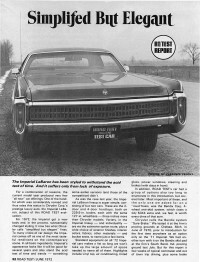 Here's a six-page Road Test article about the 1972 Imperial from the June '72 issue of Road Test Magazine. Pictured to the left are the two sides of a folded dealer invitation card. These were mailed to prospective buyers by the local dealer to arrange for a demonstration ride and - hopefully - a new car sale.